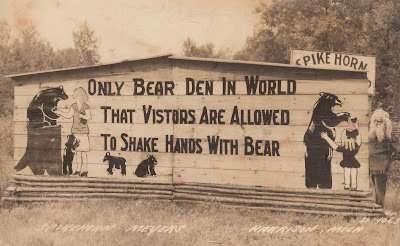 Favored local crank and bear wrangler John E. Meyers, A.K.A "Spikehorn" peers around the corner of his ramshackle "bear's den" in this real photo postcard circa 1935. He seems to be waiting for potential lawsuits…and yes, there were maulings. Welcome to Michigan! Maybe that primitive rendering of a child petting the hungry stomach of a big one wasn't too smart. Kids COULD shake bear hands, and no, there wasn't a "Don't pet the bears unless you are THIS tall" sign in the yard. Spikehorn's tombstone "bears" his name and the title "Central Michigan Naturalist" but they omitted "inventor of the sugar beet lifter" whatever that is. 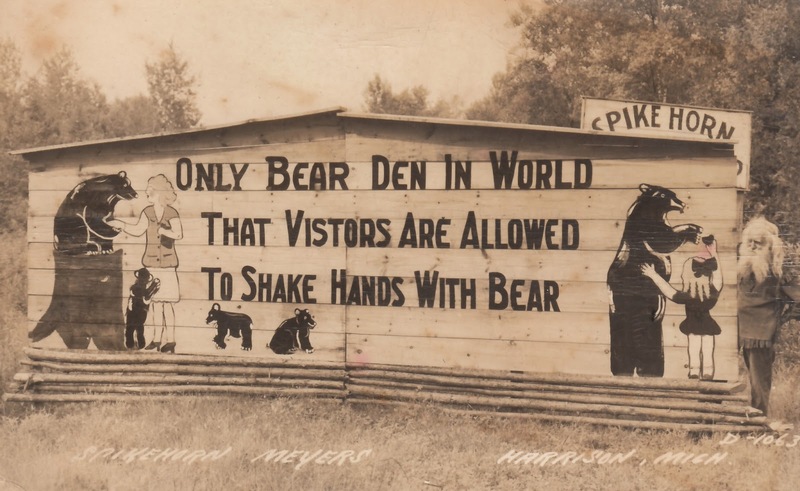 In 1937 the Owasso (Michigan) press reported Spikehorn was providing entertainment with trained bears at the founding of an early Michigan conservation club, so he must have had a den on wheels too. 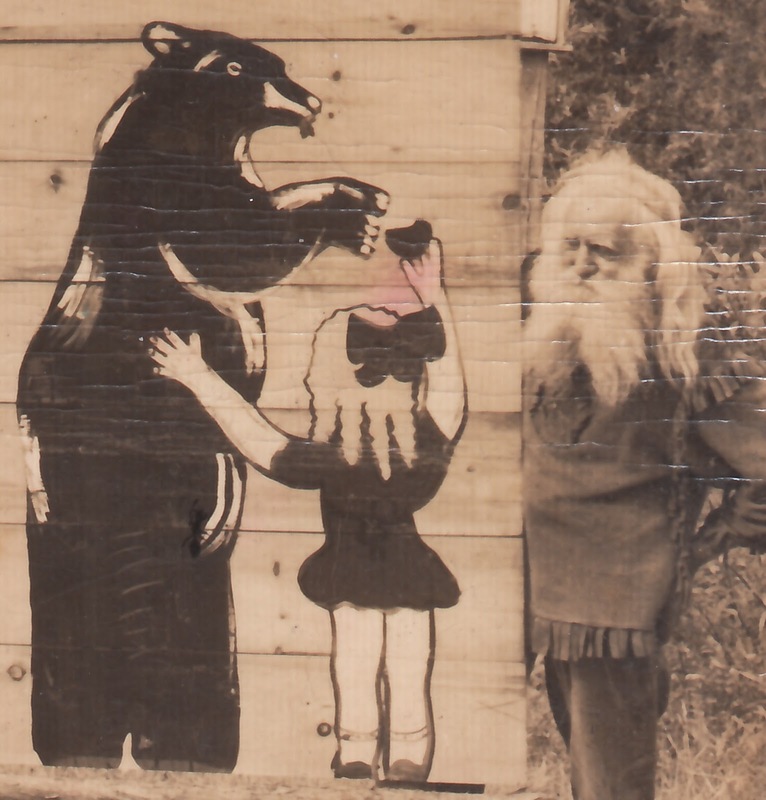 The bear dens burned down in 1957, and Spikehorn spent the last two of his 87 years in a rest home in Gladwin, MI. In 1994, T. M. Sellers wrote a book on Spikehorn, and later one of the cubs born in his den grew up to become famous as "Cubbie" in a children's book. Every few years a Michigan writer claws up the tale of Spikehorn, and this is mine…but he is increasingly known only by those who attend postcard shows. See Spikehorn Meyers in action (in color!) below. I'm from Texas and my girlfriends grandparents live in Gladwin and we were visiting and totally drove by this place. very cool. Well, now I'm going to tell my age. I visited Spikehorn's several times as a child. He had a little gift shop in the front of his "Bear Compound" and would often stroll out with a bear or 2 on chains and collars trotting along beside him. he would sit and talk to them and they would beg for a bit of something he had, and everyone enjoyed the time. If you bought a ticket, you could go inside and I think he put on a little show with the bears and a few tricks. I don't remember the show. In 1954 or 5, I was 15 or so, I was coming out of a restaurant in Harrison, and saw an old man coming up the street. He had on buckskins, jacket and pants, long blond/gray hair, and was using a walker. I stopped as I recognized him, a figure out of my past, but unmistakable, it was Spikehorn Meyers. I stood quietly and watched him slowly, and laboriously make his way into the bank. Old and crippled, he still played his part as a showman. It was the last time I saw him. Strike Up the (Native American Peoples?) Band!